It’s always a fun day when the box of seeds arrive, their colorful packages full of promise. So why are people daunted by them? Maybe it’s the preparation of the garden beds? Or perhaps it’s the angst of sowing them just right and at the proper depth? Maybe it’s the thought of having to water them faithfully until tiny green shoots appear on dark soil? Whatever your reason, this year let it go and give yourself up to their promise and the wonder of watching life begin from a tiny seed to something to eat, cut, or simply enjoy in the garden. There really is no greater feeling of accomplishment than when tiny green sprouts emerge! Success with spring and summer flower and vegetable seeds does require you to understand the last average frost date in your area. Here, in Birmingham, Alabama, our last average frost date is mid-April. The directions on a seed packet will tell you when to sow outside, usually a number of days after the last average frost date, or they might tell you to sow the seed directly in the ground and at a certain depth. 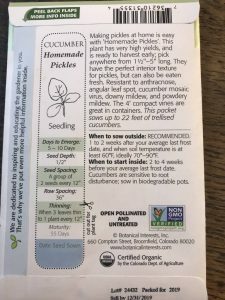 Seed packets offer a wealth of information! 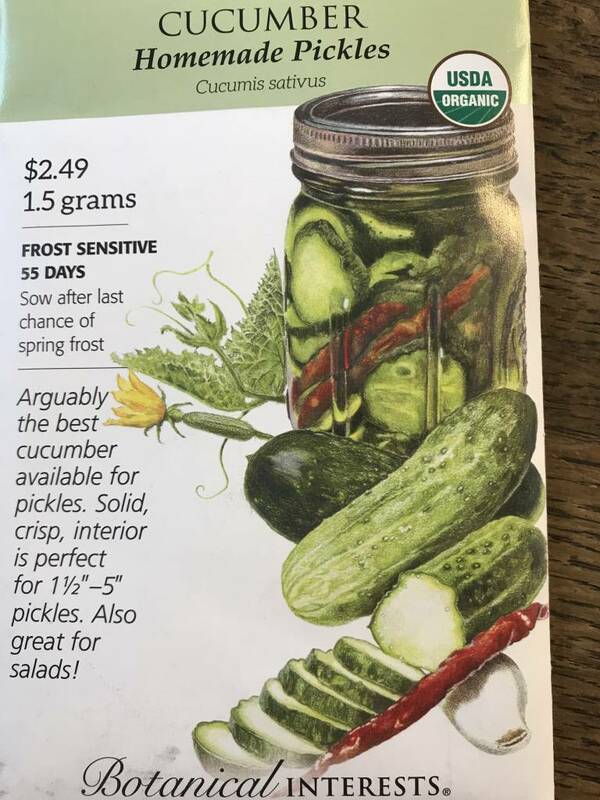 For example, the information on the cucumber packet shown here tells us that sowing outside is RECOMMENDED 1-2 weeks after the last average frost. It tell us to start them inside but that they’re sensitive to root disturbance, so if we do they should be sown in biodegradable pots that will be planted directly into the garden. It tells us that, if we have successful germination, the seeds should emerge in 5-10 days, how deeply to sow them (1/2″), how far apart to space them, and when to thin them. There’s even a picture of the seedling so you don’t mistake it for a weed! That’s a lot of information that will help us succeed in our seed planting venture. Some seeds need to be soaked for a length of time to soften their hard seed coating or nicked with a file to help them germinate. Read your package carefully for any specific instructions, and look on the inside for more information as well. 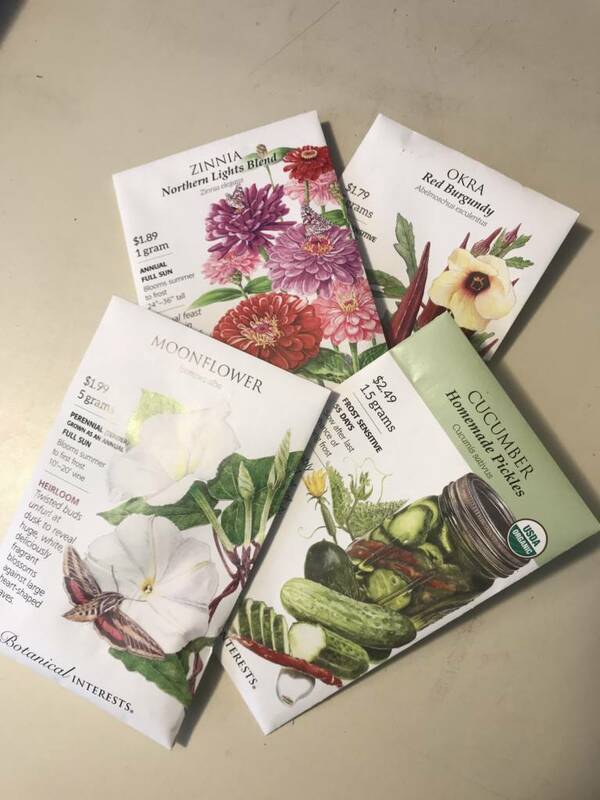 So, armed with the information on the seed packet, we know when to sow; now we need to be sure our garden beds are ready. What do we do to ensure our tiny seeds will come up? Well, the first thing to remember is that seeds need loose soil to work their way up into the light and for their roots to take hold. The best way to accomplish this is to loosen the soil with a garden fork. Break apart large clumps and remove any old roots, sticks, or large rocks. Add soil amendments, if necessary, like PlantTone, cow manure, or topsoil and rake the soil to create an even, level surface to sow your seeds. 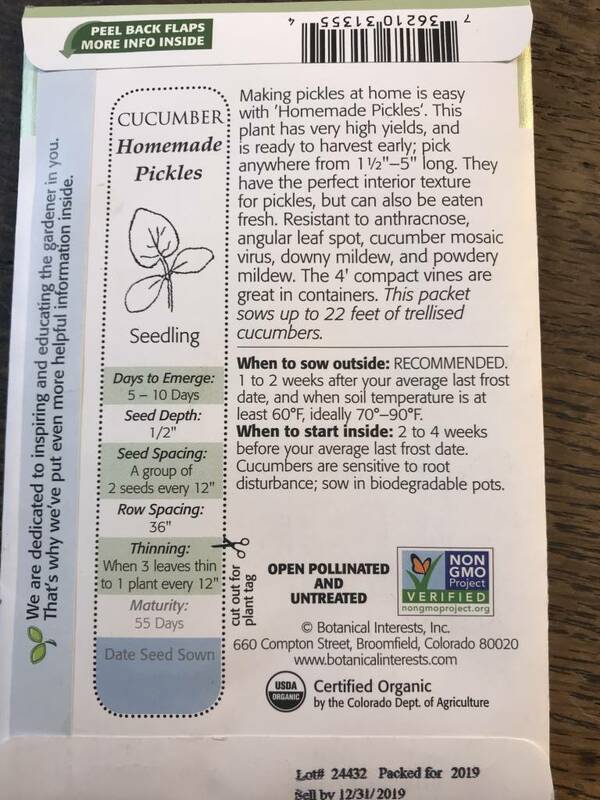 Look at the directions on the seed packet to tell you how deeply to sow them. Some might only need to be pressed onto the top of the soil where they’ll have sunlight to germinate. If you have very fine seed, a good method to ensure even sowing is to mix the tiny seeds with sand before sowing. For larger seeds create a furrow the right depth, set the seed in the furrow at the correct spacing, and gently cover. Finally, don’t forget to label each planting area. After planting your seeds it’s important to water them with a fine shower of water to moisten the soil. Here’s the important trick: You must keep the seed bed moistened until the seeds begin to come up. Be careful not to dislodge them with a strong spray of water and remember that on very hot days you may need to water twice. Seedlings need to be thinned once they’re up and growing. This is the process where you eliminate the weakest so the strongest have room to grow to their full potential. The best way to thin seedlings is to snip the ones you’re removing at soil level with your fingers or a pair of scissors. Don’t pull them as that could disturb the soil too much around those you’re allowing to stay. 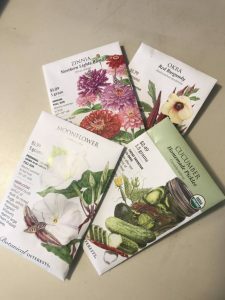 All of the above information assumes you are sowing your seeds directly into a garden bed, but in some cases you might want to start them early inside. This requires either a greenhouse or grow lights or, at the very least, a very bright window and some bottom heat to aid in germination. I remember my Dad putting pots planted with tomato seeds on top of our warm furnace in Wisconsin. He’d move them into an unheated greenhouse after they’d started growing but while it was still too early to plant them in the ground. As a general rule, don’t start seeds inside too early! Most annual vegetables can be sown inside roughly 5 weeks before the last average frost date. 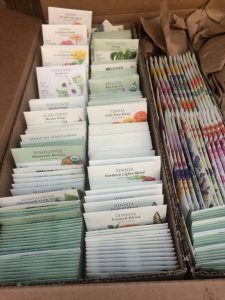 Again, follow all the directions on your seed packet and move them outside when the soil is warmed, usually after the last average frost date. So, what are you waiting for? It’s time to pick out some seeds! 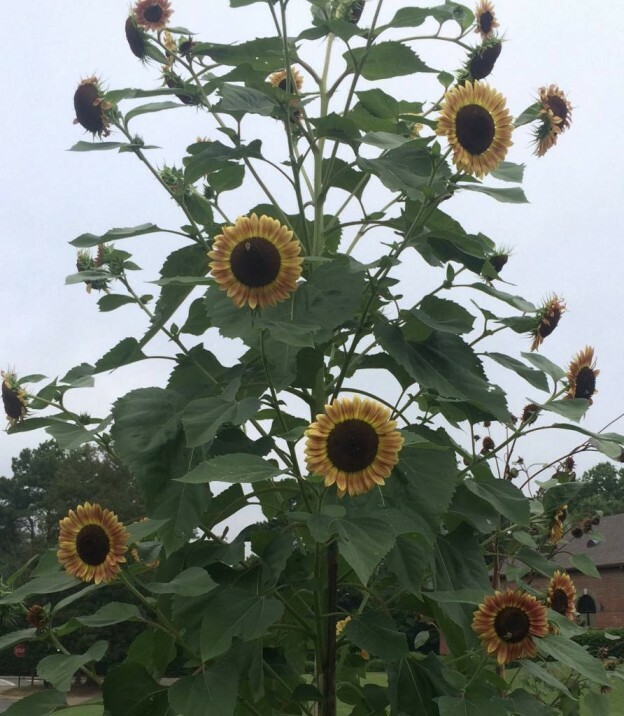 This entry was posted in Seeds and tagged flower seeds, pepper seeds, planting seeds, seeds for sunny spots, sunflower seeds, tomato seeds, vegetable seeds, zinnia seeds on March 23, 2019 by Kris Blevons.